The soil survey of Abu Dhabi Emirate was completed in two stages, the extensive (4th-order level) and intensive (2nd-order) levels of USDA-NRCS classi fi cation system. 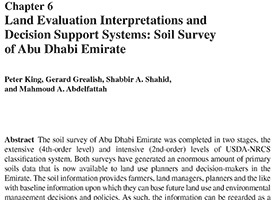 Both surveys have generated an enormous amount of primary soils data that is now available to land use planners and decision-makers in the Emirate. The soil information provides farmers, land managers, planners and the like with baseline information upon which they can base future land use and environmental management decisions and policies. As such, the information can be regarded as a great asset for future generations of the UAE. The information is stored in the Abu Dhabi Soil Information System (ADSIS) database that has been designed to provide ready online access to users. In its raw form, the majority of the soil data is only usable by specialist soil scientists and geoscientists. Land evaluation methods provide a mechanism for the soil information to be synthesised, simpli fi ed, interpreted and presented to a far wider audience. Several land evaluations were conducted on the extensive and intensive data sets generated by the soil survey of Abu Dhabi Emirate. They included assessments to identify soils suitable for the generalised land use irrigated agriculture, which was subsequently used to delineate areas for more detailed examination in the intensive survey. Assessments of other land uses including afforestation, range management, recreation, urban development, construction material and sanitary land fi ll were also conducted. These assessments can be used to identify the potentials and limitations of soils for the different land uses. However, a more detailed analytical and modelling approach is required to extract the full worth of the data set and solve complex management issues such as sustainable irrigation practices for intensive agricultural development in the Emirate.